Now: I can hear you ticking off the reasons you’re unlikely to take a chance on writer-director Kim Nguyen’s feature. Fiber optics, for one. Are fiber optics innately cinematic? On its face, would this film even appeal to fiber optics salespeople? Surprise! 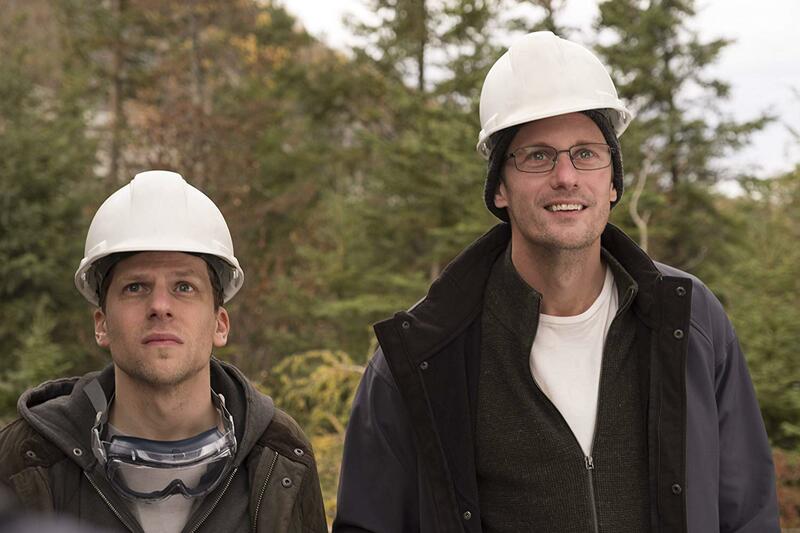 “The Hummingbird Project” basically works; it’s intriguing; the actors play it just straight enough to make it feel like a fact-based drama (though it isn’t) with a few darkly comic details. Dealing with a narrow world of dubious surface appeal, the Montreal-based filmmaker’s third English-language feature is small, but sure. It realizes its fable of ambition, persuasion and learning to smell the roses instead of counting the milliseconds. Vincent (Eisenberg) and Anton (Skarsgard, transformed via baldpate latex) are cousins, working for a stock trading outfit run by Eva Torres (Hayek, decked out in a silver-grey wig and serious financial nerd eyewear). The cousins hatch a plan to lay fiber optic cable from Kansas to New Jersey on the down-low, running it underneath everything from Amish farmland for a small fee and federal Appalachian parkland. The idea is to shave a few precious milliseconds off stock transactions, thereby making hundreds of millions in the time it takes a hummingbird to flap its wings. (Hence the title.) Early on, when the cousins resign from Eva’s firm, she knows they’re up to something. The rest of “The Hummingbird Project” chronicles that something, and Eva’s counter-moves. As a screenwriter Nguyen knows how technical he needs to get with this stuff without losing a general audience (and financial/technological dolts like me) in the weeds. Now and then someone will say, “Can you run it by me one more time, please?” for our benefit. But the story’s essentially a simple game of cat and mouse. The clock’s ticking in more ways than one; “The Hummingbird Project” rolls in a health crisis to amp up the tension, and part of the story’s satisfaction rests on characters who are in over their heads, winging it with other people’s millions in the hopes of making those millions multiply. I like the natural push-pull texture of the cousins’ relationship; I like how Nguyen allows for comedy without pushing it, such as the lovely extended take of Anton’s encounter with the feds, which ends on a tennis court. Eisenberg has a sharp sense of pacing, as always, and never asks for cheap sympathy. Hayek finesses Eva just so, avoiding a heavy hand, and the smaller but substantial supporting roles have been cast well, notably Michael Mando (as Vinny’s all-purpose project manager, increasingly fed up) and Sarah Goldberg (as Anton’s wife, Mascha, who isn’t sure what her husband’s getting into). “The Hummingbird Project” lays in its moral a little too neatly near the end, like a straight line of extraneous underground cable. Still: It moves well, looks good on a budget – Nguyen shot it in Quebec and Ontario – and tells its peculiar story with confidence. Published: March 27, 2019, 3 p.m.